Simon & Schuster Books for Young Readers, 9781442441415, 416pp. Beatrice’s new assignment is to infiltrate the visiting Scottish delegation using her subtle arts in persuasion. The mission seems simple enough, until the Queen pairs Beatrice with the worst of the lot—Alasdair MacLeod. Beatrice cannot help but think that the Queen is purposefully setting her up for failure. But Alasdair could be the key to unlocking the truth about the rebellion…and her heart. Caught in a web of ever-more-twisting lies, Beatrice must rise up among the Maids of Honor and prove what she’s known all along: in a court filled with deception and danger, love may be the deadliest weapon of all. Jennifer McGowan was born in Ohio, grew up in Montana, and studied in Paris. She fell in love with the Elizabethan era as a college student and is now an unrepentant scholar of the period, happily splitting her time between the past and present. An RWA Golden Heart Award winner and multiple finalist, Jenn is the author of the Maids of Honor series. She lives in Ohio. Visit her (and the Maids of Honor) at JenniferMcGowan.com. "This lively and fast-paced debut has plenty of action and plot twists to keep readers fully engaged." "Whether recounting her perilous missions or her moral dilemmas, Meg’s first-person narrative is consistently engaging. Meg’s adventure comes to a satisfying conclusion while leaving the door open for sequels." "This novel encompasses all the glory, excess, and intrigue of Queen Elizabeth I’s reign; the issues surrounding Catholicism versus the Church of England; and the poor relationship between Spain and England. Full of adventure and romance and starring a very likable, spunky protagonist, this is an enjoyable historical read." "This historical romance stays true to the politics and fickleness of the Elizabethan court. The language, thoroughly modern in places, can take readers out of the period. This, however, does not detract for the intrigue, drama, and heartache of the well-developed plot. This series will be a hit with teens and quite a few adults." 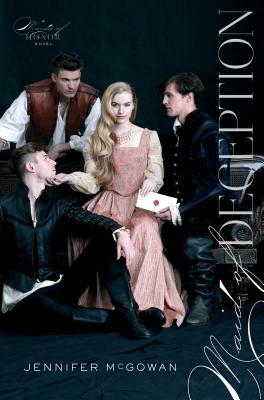 "The well-paced narrative creates a drama of court intrigue laced with treacherous secrets, dangerous liaisons, and passionate embraces. Readers who enjoyed Maid of Secrets (2013) will delight in the return of all five maids and their queen." "The real intrigue of the story is in the blending of history and secrets."